Thule Urban Gilde Review: What's Best For Your Baby? 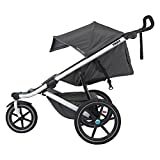 The Thule Urban Glide Jogging Stroller is easy to maneuver, made from high-quality materials and gets rave reviews from parents for run-ability. It is a top-rated jogging stroller for a reason and great to use for running errands or day trips to the park. If you are considering investing in a good jogging stroller that may be used for additional children in your growing family, this Thule Urban Glide review will help you narrow down your choices and make a well-informed decision. 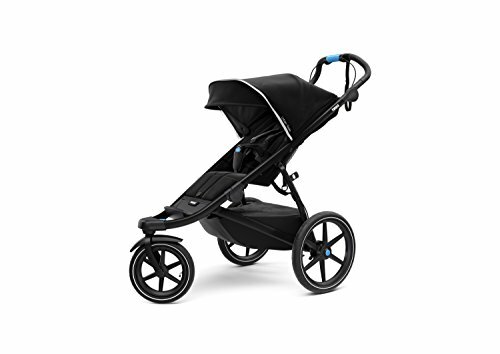 The Thule Urban Glide Stroller is considered one of the best jogging strollers in the industry. Any parent who has owned one is happy to recommend the product to others. It provides the user with excellent performance in terms of run-ability and its ease of use. It also sells for a competitive price among other top-rated joggers. This is a versatile product and when you are talking about baby gear, you need something that can be used for more than simply jogging. You need a stroller that can also work well for trips to the grocery store, the zoo, or the park. This product does both with ease and includes several features that allow it to stand out when placed side-by-side with its competitors. It was once believed that the jogging strollers with a fixed wheel were considered the best for those serious about jogging. However, the new generation of locking, swivel wheels are becoming very popular with runners based on recent Thule Urban Glide review blogs. This shows that the more versatile jogging stroller that can be used for exercising and running errands is preferred by more parents. The Urban Glide has a locking swivel front wheel that stays straight with adjustable tracking that will keep you on the right course. The stroller is easy to turn and tip back with very little rolling resistance. The rubber tires and rear suspension makes it easy to push and even professional runners say that it has great run-ability. This jogging stroller doesn’t wander, and the locking wheel mechanism makes it easy to switch from a swivel front wheel to a fixed one. The Thule Urban Glide jogging stroller has plenty of features that make it a breeze to use. These convenient additions allow you to focus on your jogging workout more as you worry about the brakes or your items staying intact less. The stroller features a one-handed fold that is easier than other jogging strollers out there. The mechanism used for folding the stroller is located under the leg rest. It slides and twists to fold the stroller. You can also use the fold handle to roll or lift the stroller after using the manual lock. The brakes are single action and not difficult to set and release using the large wire pedal that is in the middle of the rear axle. It is easy to flip the pedal up with your foot for hassle-free braking. A great stroller will always have plenty of storage space to hold your baby’s necessities as well as your own. The storage bin on this jogging stroller is very large and has a weatherproof zippered cover that will prevent your items from falling out. This storage bin is easy to access from either the sides or the rear of the stroller. It has a maximum weight capacity of 10 lbs. And for additional storage, there is also a mesh pocket on the back of the seat that is perfect for holding your cell phone or keys. The canopy is just the right size to keep your baby shielded from the wind and sun’s harmful rays. It can rotate forward to provide ample protection and has a peek-a-boo window with hook and loop closure. The 5-pont harness system is easy to adjust with straps that tighten at the shoulder and waist at the same time. It also has adjustable shoulder and crotch straps which aren’t always included in other strollers. The Thule Urban Glide stroller is compatible with a broad range of infant car seat carriers so that you can use the stroller from birth. You can purchase the Thule Infant Car Seat Adapter which works with various brands including the Chicco KeyFit 30 and the Uppababy Mesa Infant Car Seats. Hopefully this Thule Urban Car Seat review has been helpful with your search for finding the best jogging stroller for your child. This product is strong and durable and a great choice for growing families who like to stay active and outdoors. If you would like to invest in a jogging stroller that has plenty of safety features and one that is just as beneficial to the parents as it is to the baby, this stroller is an excellent choice for you.